As usual in those days, nothing sold. Shortly after the show closed, however, the gallery’s co-owner, Eugene Thaw, visited the small yet elegant apartment of twenty-four-year-old William Rubin, then a conductor-in-training but later chief curator of painting and sculpture at the New York Museum of Modern Art. There hung a Mitchell, Rubin’s first serious art purchase, made directly from the artist, paid for in $50 or $70 installments, and financed, in part, by the sale of two fine pre-war clarinets. On the heels of her show, Joan more or less cut Thaw dead: “She already knew she was a star.” Indeed, she was quickly elected to membership in the Club, the mark of approval that mattered to her more than anything else. A month later she participated in a Club panel about Abstract Expressionism, alongside Grace Hartigan, Alfred Leslie, painter Larry Rivers, and poet Frank O’Hara – a bunch of kids (the oldest, Grace, turning thirty the following day) sharing their tremendous excitement about what was still to come. 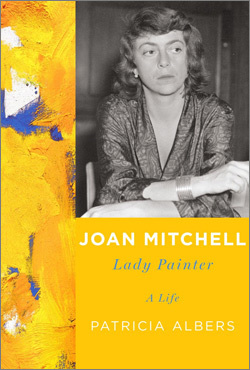 Meanwhile her oils continued to evince Joan’s total involvement in the act of painting: complex and alive, they could not be more different from cool, hard-edged Pop. Take that, Pop Art! Joan seems to say. And that! This is what real painting looks like. (“To paint,” she once declared, “is to know how to resist paint.”) As delectable as they are raw, her paintings court chaos with their sweeps of disrupted syntax, surpassing the viewer’s ability to process them in a conscious way. Deep greens, orange-reds or persimmons, and cerulean blues – colors she used over and over again – well up into patchy cumuli suspended in thinned whitish washes agitated by wisps, Xs, tattings, and cascading drips of pigment. Everything about these luscious chromatic canvases speaks of the artist’s all-consuming lover’s quarrel with oils. Paint meets canvas in every conceivable manner: slathered, swiped, dry-brushed, splattered, dribbled, wiped with rags into filminess, smeared with fingers, slapped from a brush, smashed from the tube, affixed like a wad of gum – a glorious visual glossolalia.